Section 54 was basically brought in to stop situations, where to simplify the matter greatly, you made a claim on a policy and you forgot to cross every “t” and dot every “i” and the insurer then decided that it would decline the whole claim on a technicality, even though the insurer really wasn’t in any worse position because of what you did or failed to do. This was a very common issue for many people prior to the enactment of section 54. Section 54 is an important section because what it effectively means is that where a claim is made that would normally be covered under the policy, but due only to the insured doing something or failing to do something, the insurer has the option under the policy of declining the claim entirely. Instead, section 54 says that the insurer must pay the whole of the claim unless it can show that it has been “prejudiced” in some way. Any prejudice must be specified and if accepted, will allow the insurer to reduce its indemnity by a percentage corresponding to the prejudice suffered. Can an insurer deny a claim? Section 54 does still allow an insurer to completely deny a claim where it can show that the insured’s act or omission caused the entire loss suffered. 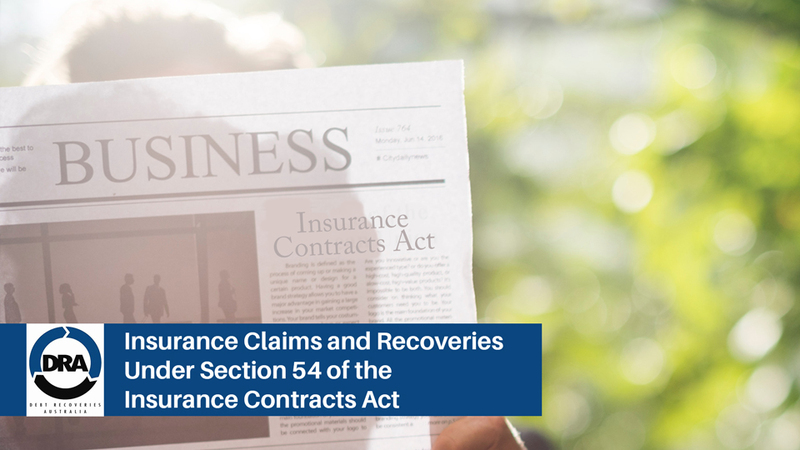 Section 54 also allows an insured to respond to this claim by showing that if any part of the loss was not caused by its act or omission, then the insurer must pay out the loss not caused by the act or omission. If you have made an insurance claim, which has been completely denied, make sure that you read the letter of denial to see why the claim has been denied. If the insurer claims that you did something or failed to do something required by the policy and denies your claim, then you may have grounds to contest the denial. Section 54 prevents an insurer from refusing to pay a claim following an insured’s non-compliance with certain terms of an insurance policy, instead only allowing it to reduce its liability if the insured’s conduct has caused its interests to be prejudiced. It operates as a shield for insured parties to prevent Insurers from denying claims based on minor breaches of the insurance policy. 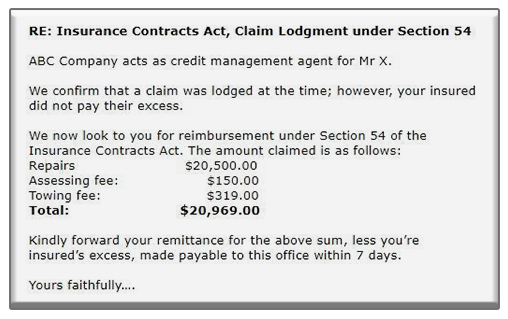 Previous to this part of the act, a breach of policy conditions would allow an Insurer to refuse payment of the claim. Section 54 prevents the Insurer from refusing to pay the claim. If you are attempting to recover from a third party insurer, who is saying their insured has not paid their excess, you can request an Insurer to pay under Section 54. The Insurer will simply pay less their insured’s excess. There is no harm is doing so, although there is no legal recourse if they refuse. The beauty of the Act is that anyone can apply and it’s free to do so. The disadvantage is that many insurers do not understand or acknowledge this part of the Act, or choose to ignore it, knowing there is no legal recourse. I hope you have some success in your recoveries under Section 54 of the Insurance Contracts Act.